Happy New Year to All My Friends n Fellow Bloggers.Today is already 6th day of 2012,I know I'm late to post the wishes,most of u might have observed that there are no new recipes updated in my blog for quiet a long time.One n only reason for all this is I was busy managing the pregnancy and finally we are blessed with a baby boy on Nov 30th 2011 and named him 'Adhrith'.Me n My LO had lil rough start but now we are doing well. 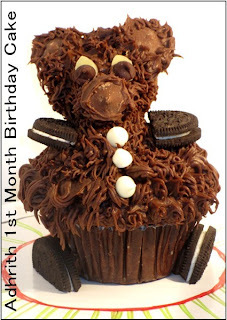 Adhrith completed his 1 month and I made this simple cake for his 1st month birthday. I need your best wishes and blessings for our Little one. 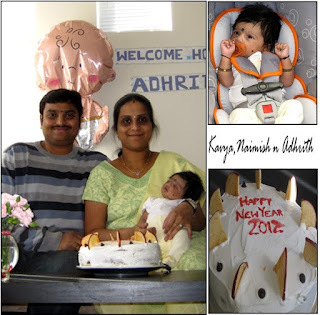 Congratulations, Kavya.. nice name and cute baby.. and just awesome cake.. hope you can give us the recipe soon.. take good rest and Happy new year! The teddy bear cake is very cute & looks delicious! Congratulations, gain!